I had the pleasure of providing flowers for a friend’s wedding this summer, and in the process learned a thing or two about tabletop floral displays, namely that dahlia blossoms perform beautifully out of water. Who knew? I also learned that some love seems as natural, and effortless as breathing. Congratulations Rachel and Dan! The bride and groom invited their friends and family to a welcoming outdoor venue boasting open fields flanked by towering firs and dotted with teepees and buildings of rustic charm. When my friend Nancy, the mother of the bride, told me of her idea for a tablescape (my ten-cent florist term), I was skeptical that it would work. In my mind, all I could see was a table-length trail of wilted, flattened, mostly dead flowers. Weeks before the wedding, when I first I heard of the floral plan, I wanted to say, “Ummmm, that just won’t work.” But before this big flower farmer ogre dashed anyone’s dreams of a dream wedding, I thought it best to reframe my opposition into experimentation with the flowers in question. How long would a dahlia look good out of water? Well, I’m no flower physicist, but I did my best to enlist my tabletop laboratory for a little dry run (so to speak). I simply cut a variety of dahlias in full bloom, removed the stem, and arranged them face up on my front porch table. I expected noodle-soft petals within hours. Instead here’s what I found: healthy, bright dahlias, completely intact and without a wilted petal among the lot. Take a look for yourself. Freshly cut dahlias (left to right): Alfred Grille, Bantling, Eveline, American Dawn; bottom row, Thomas Edison, Big Brother, and Cafe au Lait. Six hours later, the dahlias still look great, no wilting or dehydration. One day later and the dahlias still look remarkably fresh. The larger decorative informal type on the bottom row have a few droopy outer petals. 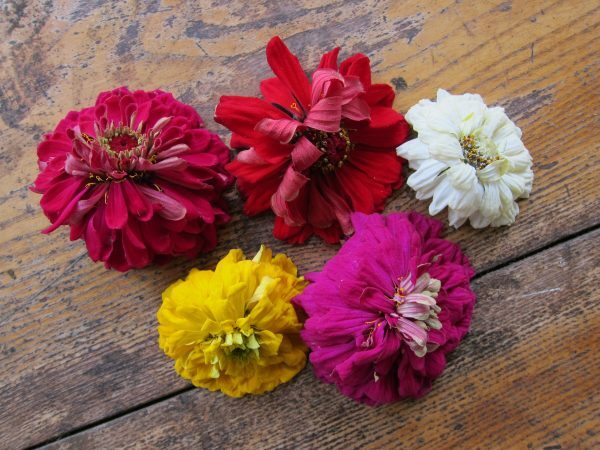 The upper row, pompom and ball dahlias, fare even better with smaller, stiffer petals and compact size. I was quite surprised that even after two days out of water, the dahlias still had a welcomed place at the table (make that, on the table). There you have it: Dahlias without water, and a wonderful way to decorate a table. Vases need not apply. And while I love dahlias, these two bright blooms really stole the show. Dahlias never cease to amaze…..and yours are truly gorgeous. I was unable to bring a single blossom inside this year–they were infested (!!!) with earwigs. Do you have any problems with them? Thanks for the tip, Tom. I shall try that next year! When I lived in Lynnwood (WA) I gave up on trying to grow dahlias for that very reason; earwig infestation! It was awful! I have been through 2 seasons of dahlia blooms since moving to Port Townsend and have not had any problems with earwigs. I think that it was because there is less sun and wetter climate there. Do you live somewhere where you get more rainfall? Well. I’ll be!! Your post came just in time for CanadianThanksgiving, so my table will be decorated with dahlias – out of water! Thanks for the timely posting, Tom. And your dahlias are very, very beautiful! Happy Thanksgiving Sandra. I’d have to say this American is quite thankful for having the privilege of visiting your beautiful country and knowing many of your fellow countrywomen and countrymen as friends. Oh, and by the way, what are the popular desserts for Thanksgiving in your neck of the woods? Your dahlias never cease to amaze and dazzle, Tom. I’ll be trying the “no water” technique. And your writing is always entertaining and so welcome. You lift spirits. Thanks Stephanie, your kind words lift mine! Did Buddy get a “doggy bag”? You asked about a Canadian Thanksgiving dessert. Pumpkin pie would have to top the traditional menu. My daughter is getting married next August 12th at our cabin so this post was quite inspirational! If were to grow dahlias next year would they be blooming in time for the big event? Hi Karen, Congratulations! Yes, dahlias around here really start to kick in around mid August and get their bloom on all the way until October. I would also ask around and see if there are any dahlia growers or farms nearby. It’s always a good backup plan, or at least check with friends who could add to flowers from their gardens if you come up short. Good Luck! How beautiful! I am very envious of anyone with a large dahlia garden — especially, the large dinner plate variety. Do you think I could intersperse bulbs throughout my vegetable beds? Absolutely Eileen, and the more you cut it back, the more it blooms. Also there are different varieties that lend themselves to different purposes, such as gallery dahlias, low growing and bushy, or at the other end of the spectrum, dinnerplate dahlias usually tall and bold in their presence, a nice focal point in the background of border, usually need staking as top heavy blossoms may topple. Good Luck! Thanks for sharing the results of your dahlia experiment, Tom. I am a bit surprised how well they did sans H2O. I now follow you on Pinterest and Instagram. I am also a pie-loving flower farmer.